LEGO Customer Services has published Instructions and inventories for a number of 2019 sets already. There are some 91 new parts among them, including some brand new design IDs, although some are new IDs for existing designs. The most interesting to me are two new gears, used in 41366 Olivia's Cupcake Cafe: Gear Wheel 2X2, Z6 (35442) and Gear Wheel 4X4, Z10 (35443). I wonder what use they'll be for GBCs? The turntable part that I mentioned in the Corner Garage review is also listed, as Turntable 2X2, Female, design ID 27448. Now I see what New Elementary meant by "splat gear". The gears do look interesting although I wonder how much slack / backlash there will be with them. It wouldn't surprise me if they are used as flowers in some sets. Can you add in a drop-down bar for "date added" to the parts lists like you have in the instructions lists? 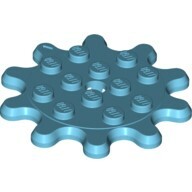 ^ Possibly, but in the meantime, if you go to https://brickset.com/browse/parts you'll see a list of dates that will link to parts added on that date. Seriously, the bionicle tusks? In colours they've existed in for a decade and a half? @Lego34s: I don't think so. I suspect it's more likely that the older molds for that piece finally wore out and they made some changes/updates to the design before introducing new ones. After all, LEGO Customer Service doesn't cross-reference their own part listings the way Brickset does to show you how many other sets each element or design comes in, and more often than not BrickLink doesn't acknowledge these kinds of slight part updates at all unless they noticeably change the look or functionality of the piece. The gear plates and 2x2 turntable base are probably the most exciting new elements to me this time around, but there's a lot more I'm looking forward to with the new releases in January! those gears look like really old lego gears from the 1960's that I saw once. These look like a lot of fun - and I'm glad to see they clip to a turntable base, unlike the disastrous ones they introduced to DUPLO last year that just rest loosely on the studs underneath and fall over at the slightest touch. What on earth are trans blue and red bohrok eyes dong in the new parts list for 2019? Those parts have been out in those colors since 2001! @Lina Nui: If parts get removed from production and then later put back into production they’re often assigned new Element ID numbers and treated as new elements. But these also have new Design ID numbers which suggests they also use an updated mold. Possibly they redesigned it so the back of the piece shows the LEGO brand name? After all, those were a notable part that didn’t have the brand name on them originally, and LEGO has updated other parts like the minifigure head and 2x2 dome brick over the past several years to add that and make it harder to confuse them for off-brand parts. Looking forward to the pearl gold torso... it was possible to build one using various part but now we have a clean way to do it. This may be completely unrelated, but has anybody else noticed that Rex's Rexplorer is not the same ship as the large one in the Lego Movie 2 Trailer? Makes me wonder if that means the D2C set will be his big ship. ^ it is unrelated ;) but I noticed this too. I also wonder if Lego Movie 2 will have a CMS. In keeping with the spirit of this article, are all the new pieces revealed or just the ones in sets that have been revealed? What about new pieces for sets that haven’t been revealed yet? Some great new parts here, and nice colours too, i look forward to purchasing mass amounts of them via Bricks n pieces.. Does the turntable base 27448 allow a cross axle to go through and rotate? ^ Yes, but it's too loose unless there's a 4x4 round plate, or one of the new gears, attached to it. One thing I notice about the 'splat gears' are the number of teeth - 6 and 10; multiples of 2 but not of 4. That means you can place two together and have one rotated 90° to the other. That way the studs on both line up EXACTLY. You can't do that with anything built on the technic gears as they all have multiples of 4 teeth (8, 12, 16, 20, 24, 40) so are always slightly out of alignment when meshing. I notice the tops of the teeth are chamfered too - hopefully that means they can mesh around (internal) corners.